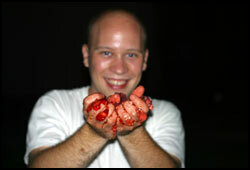 I put up a gallery of photos from the Jello Party this weekend. Anyway, what this really means is nice low-blur pictures at the Jello Party this friday. I also slapped a few new photos up in the New! section of my photo gallery, only a few of which were taken with the new lens. Here is an example collision for the real, off-the-shell MD5 algorithm. You can verify for yourselves at home! This includes SHA-0 (already announced and verified), MD5 (sort of verified) and SHA-1 (rumored). MD5 is quite popular and SHA-1 is the government standard. These are used in digital signatures, which are a vital part of most public key cryptosystems, like the one used for securely browsing the web. Someone has verified the collisions for MD5 (actually they are for a trivially different variant of MD5 with byte order swaps). Just knowing that collisions are out there would be bad enough, but their attack apparently only takes 1 hour to run (with an extra 15 seconds or so for subsequent collisions) on a medium-power cluster (IBM P690). When the details come out, that little padlock icon in your browser will become a lot less meaningful, at least until we refit the internet with replacement algorithms. This weekend I finally made a new album (my last one was over six months ago!). 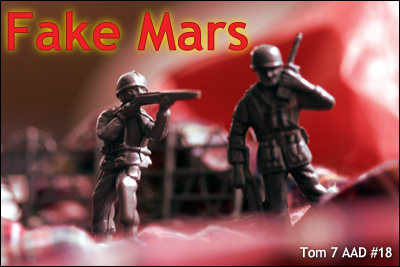 I think it came out pretty well, but you can judge for yourself by listening to Tom 7 AAD #18: Fake Mars. For those of you who are just joining us, almost all my music is made this way: in 24-hour explosions that I call album-a-day. The escape server now has an RSS feed of new levels with screenshots. Thanks, libpng! By the way, I expect to have a proper "beta" of escape sometime in the next week or so. There's just one more major feature on the critical path.